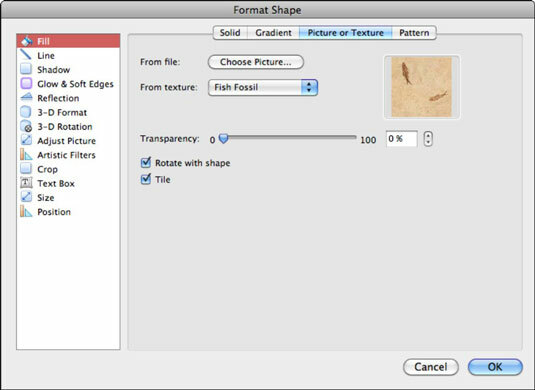 In Office 2011 for Mac applications, shapes can be filled with a picture from a file or filled with one of several textures from a menu by way of the Picture or Texture tab of the Format Shape dialog. 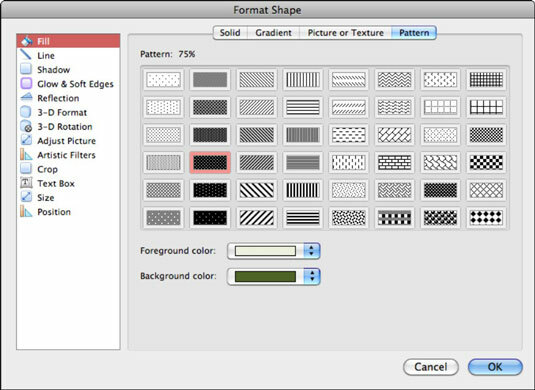 Patterns are geometric designs that use two colors, and they’re accessed from the Pattern tab in the Fill panel of the Format Shape dialog. Choose Picture: Click the Choose Picture button to display the Choose a Picture dialog. Browse or use Search to find a picture file and then click Insert, and your selection fills the shape. From Texture: Click the From Texture pop-up menu to look through some texture options. Unlike pictures, textures tile (most of the time, seamlessly) in the shape area. Transparency: Drag the slider or use the spinner control. Rotate with shape: When selected, the picture or texture rotates when the shape itself is rotated. Tile: When selected, the texture or picture is tiled within the shape. By using this option, you can make any picture behave like a texture. When filling shapes (especially in charts and graphs) that will be used for publication, especially when you are limited to two color prints as in black and white. When you want to make it easier for color-blind people to distinguish colored areas by adding visual cues. When you plan to print your output in black and white, or grayscale. Whenever you desire a high-contrast fill. Using a pattern is a matter of clicking a pattern to choose it. The default is black and white, but you can adjust foreground and/or background color as you please by clicking the Foreground Color and Background Color swatches.